Have you ever thought that marketing your small business would be easier without competitors? The truth is that most of us have thought that way. Whilst you shouldn’t be fixated on your competitors, you can’t afford to ignore them. When there are plenty of jobs and business to go around we tend to get complacent and fail to do the things we need to do to stay competitive. We tend to take customers and employers for granted. Customer service drops off and innovation goes by the wayside. Having competition is healthy and you would find the following reasons useful. When you’re on the treadmill of a business boom there simply isn’t enough time in a day to stop and really evaluate every single customer. While others are getting all the customers, you have ample time to evaluate and appreciate every customer. Make customers fall in love with you and treat them right. Then when competition comes along they won’t even think of going anywhere else. Innovation is important to you and your company because competition makes you constantly innovate. When your business is number one or the only one, innovation tends to be ignored. Innovation is incredibly important and is woven into the fabric of what great businesses do. You may not always know what your strengths and weaknesses are until your competition points it out. Competition helps narrow your focus a little and concentrate on what you’re really good at that your competition isn’t. Competition is not only good for your business, it’s good for consumers. This is so because consumers get the opportunity to pick and choose who gets their money, time and attention. Competition reminds you every now and then to focus on your key customers. After all, they are the reason why there is more cash inflow. By focusing on them you also come up with ways to serve them better. Indeed when you have various customers you have a huge task to always serve. Competition makes it very mandatory to keep serving and seeking new ways to serve your customers. Because you have a mandate to always give your clients a run for their money, competition makes you to put on your thinking cap for better ways to add value. Creative thinking forms the bedrock of any success-minded brand. You are able to learn from other competitors what works and what doesn’t. By learning this you will be able to decipher what plans and strategies or even products would be detrimental to your business. You are enabled to study your strengths and weaknesses. Your weaknesses help you become better, while your strength drives you harder to achieve more. Competition automatically pushes you out of your comfort zone because of the quest to serve better. 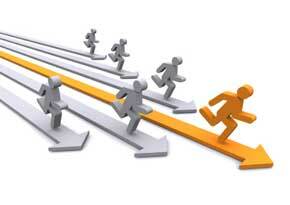 Leaving your comfort zone also helps you to strive to beat the records of your competitors. When there is competition amongst brands, consumers benefit from through the promotions or other good things that could capture the consumers. Strong competition can actually help your business because they keep you on your toes. They also provide valuable market insight, and force you to keep your product strategies fresh. There are very difficult customers whom you just cannot please. Trying to fit them into your plan could end up frustrating; so you have the choice of leaving such customers to your counterparts to deal with. You can learn from what your competitors have put in place to adjust your plan. You are also able to draw inferences from the way they run their businesses, plus their products and services. When a brand isn’t monopolized, there is the ability to form a regulating body in that industry. This is so important because this body is able to serve as watch dog for those who might be defaulting in certain areas. You cannot afford to work at a snail rate when you are in competition. When there is competition you must be up and doing and to speed at all times. When in competition one of the ways to always come out tops is reading and researching voraciously. When you read and research widely you will be abreast with issues. Learning new things from your counterparts is a sure banker. You would learn to broaden your horizon and at the same time add to the growth of your brand. There is always something new to learn in an industry full of competition. Your employees have a whole lot of experiences to learn from. Experiences like; how to handle customers when there is business boom and how to deal with situations when your competitors have more customers than you do. All the experiences you garner during this period, becomes a good raw material to help develop your brand. Check the track records of bigger brands; you will see that they put to good use all the experiences they experienced. Kill that paranoia and begin to glide through your competition rather than feel upbeat. The very moment you become scared of competition and not take advantage of it, you give room for failure to set in. Failure can never get your brand anywhere. Look up with hope and face your competitors. Competition motivates — it makes you review your lapses and improve yourself. Without competition, your business may make money, but it definitely can’t win over customer loyalty.